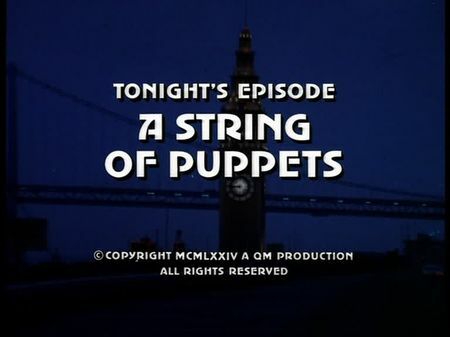 I have just added the screencaps for A String of Puppets to the episodes' page. An ex-con, Harry Gates, is killed while being on the phone with Mike Stone, and an eye-witness provides an important detail concerning the get-away car. The suspect, however, delivers a perfect alibi: he was with his parole officer, Bob Mason, when Gates was killed. Interestingly enough, Gates also was one of Mason's parolees. Therefore, Mike suspects Mason to pull his ex-cons back into the business for burglaries. Due to Mason's clean slate for over 20 years as parole officer, Mike's supervisor as well as the chief of parole office are anything but pleased with Mike's suggestion: to channel Steve as an ex-con into the group of Mason's guys - but Captain Olsen finally approves the operation. Steve gets in touch with Mason and is soon under observation. In the meantime, our cop tries to get more information on what happened by chatting and - somehow unintentionally - flirting with Gates' former girl-friend, nightclub singer Jackie Sterling. Little does Jackie know that Harry put a locker key in her coat's pocket the night he was killed. Everythings seems to be inscrutable until another ex-con of Mason's, Ben Driscoll, is injured in the car wash facility they are all working for. With Jackie finding the locker key and picking up the trumpet suitcase Harry deposited for her, and with Mason's guys involving Steve in another burglary, things are gaining momentum. However, Jackie still things Mason just wants to help his parolees, so she makes a premature and fatal call. There's lots of filming locations in this episode. It starts out at the then-famous 'Yellow Brick Road' nightclub in North Beach, where Jackie Sterling performs at night. Mike meets Mason under the southern end of Golden Gate Bridge where the latter talks to one of his parolees. Mike is waiting for Steve - who is just returning from Lake Tahoe - in front of Steve's apartment at 287 Union Street, and Mason takes our undercover cop to a car wash facility at 10th and Market (now demolished). After talking to Jackie and playing trumpet with her band (more or less), he walks her home to her apartment at 795 Burnett Ave, in Twin Peaks district. Soon after, Tubbs picks up Steve at Bay and Powell (we can see former Caesar's Restaurant in background which was recently closed), and the burglarly takes place in a jewelry store on Columbus Ave. In the meantime, Jackie finds the locker key Harry had put into her coat, and later on she empties a lockbox inside 3rd & Townsend Station of the Southern Pacific Railway (demolished). Towards the episode's climax, Tubbs is shot by Mason in his apartment at 9th and Diamond, before Mason 'takes care' of Jackie and, finally, is shot by Steve on the street in front of Jackie's aparment.